Fra Andrew Bertie, prince and grand master of the Knights of Malta, has died, the ancient lay Roman Catholic order said Friday. He was 78. Bertie, who was the 78th grand master of the 900-year-old charitable order, died Thursday in a Rome clinic, the Order announced. No information on the cause of death was given. Bertie was elected to lead the order in a secret conclave in 1988. He is credited with modernizing the Knight's humanitarian programs, increasing membership as well as boosting diplomatic relations and extending its reach in troubled and far-flung regions. Pope Benedict XVI sent his "heartfelt condolences to the order, praising Bertie for his work and devotion." The grand commander of the order, Fra Giacomo dalla Torre, was sworn in as interim head of the group until a new grand master is elected. Elected for life, the grand master post carries the title of prince. The grand master must have 200 years of nobility on both parents' sides and must have followed vows of poverty, obedience and chastity. Bertie's mother, Lady Jean Crichton-Stuart, was a descendant of the Stuarts, the ruling family of Scotland from 1371-1603 and of England and Scotland from 1603-1714, with an 11-year interruption in the 17th century. Born in London in 1929, Bertie joined the knights in 1956 and took his vows in 1981. Grand-Duke Henri of Luxembourg was to have been invested by Fra Bertie as Knight of Honour and Devotion of the Sovereign Order of Malta on Thursday. 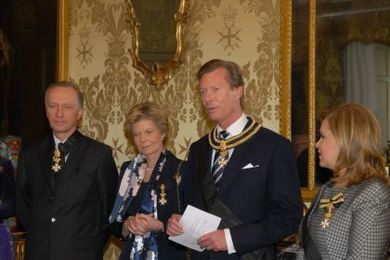 The grand commander, Frà Giacomo Dalla Torre del Tempio di Sanguinetto, stood in for him and also gave Grand-Duchess Maria Teresa the insignia of a Dame of Honour and Devotion. At the same time Archduke Carl Christian of Austria and his wife Archduchess Marie-Astrid (sister of Henri of Luxembourg) were granted the same honours. From the website of the Order: The Order of Malta is one of the few Orders created in the Middle Ages and still active today. It is also the only one that is at the same time religious and sovereign. This is due to the fact that most of the other Orders of chivalry lacked the hospitaller function which characterises the Order of Malta, so they disappeared as soon as the military purposes that represented the reasons for their existence ceased.